Computer Maintenance and Service Plans. Monthly PC Maintenance Plans. Why is computer and network maintenance necessary? 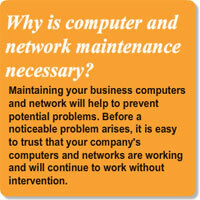 Quite simply, maintaining your business computers and network prevents costly problems. Before your first equipment crisis, we all believe our company's computers and networks are working and will continue to work perfectly forever. Not a chance. While it's true that advancements have made both computers and networks more reliable, they are still a collection of complex hardware and software, performing billions of calculations, while under constant assault from viruses, spyware, and their users. As a result, computers require regular maintenance to avoid major problems and maintain optimal performance. Quick Tech Pro's affordable and convenient computer and network maintenance plans allow you to spend your time and energy on your business' success instead of your company's computer and network functionality.